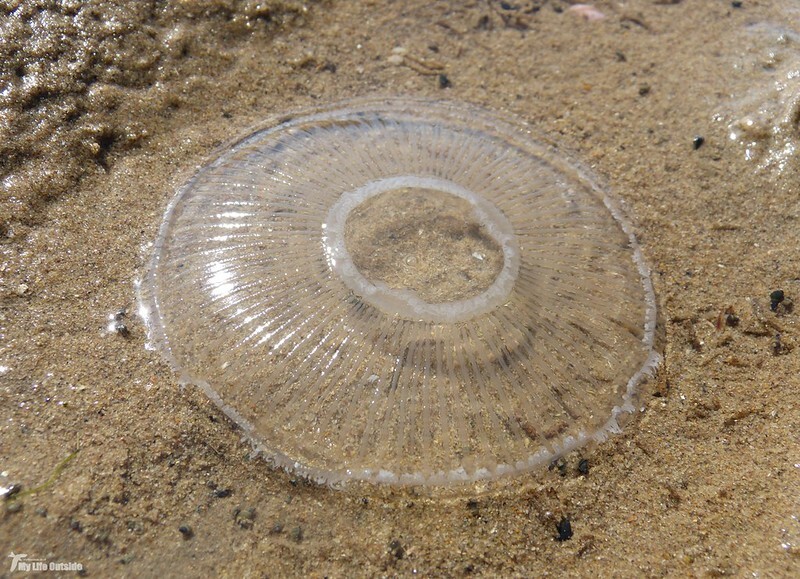 A couple of weeks ago we made the first of two very successful visits to Whiteford on Gower where an unusual jellyfish species had me somewhat stumped. We are used to seeing the more common Barrel and Moon species washed up there but this individual was clearly something completely different. Tonight I finally got chance to sit down and do some proper research which has led me to the surprising identification of the above as a Crystal Jellyfish. Usually found in the North West Pacific they are extremely uncommon anywhere in British waters let alone off the coast of Gower. The first recorded sighting in Scotland came in 2009 with Cornwall getting in on the act just a couple of months ago. Beyond these scant sightings it seems that the Crystal Jellyfish is a relative unknown so it's worth keeping an eye out on the off-chance that there may be more of these rare creatures out there.